This video of the Wolf Conservation Center has a lot to say about the beauty, character, and value of these iconic animals. Beyond being beautiful, wolves are critical keystone species. By regulating prey populations, wolves enable many other species of plants and animals to flourish. Without predators, such as wolves, an ecosystem fails to support a natural level of biodiversity, and may cease to exist altogether. They are one of the few species of mammals who can tolerate these harsh conditions. Arctic wolves are usually smaller than gray wolves, and also have smaller ears, slightly shorter muzzles, and shorter legs to reduce exposure to the frigid air. They live alone or in packs of about 6 wolves and are usually all white with a very thick, insulating coat. 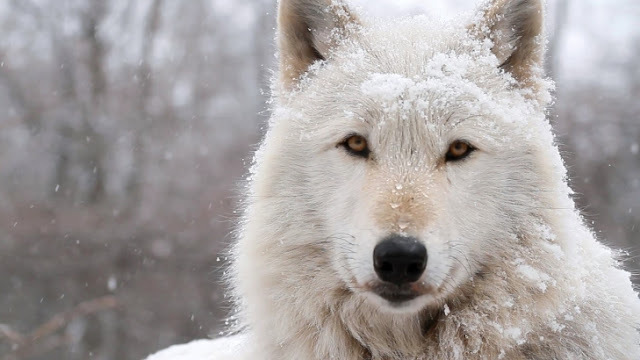 Responses to "Beauty of an Arctic Wolf Captured in Just Two Minutes"
Once excepted a wolf is your friend and family for life ,What a wonderful feeling this is,I wouldn't trade it for anything !